A Gallery Wall in the Master Bedroom + Tips on Creating Your Own! The master bedroom has been our side project the last few months. I work on in my spare time, continually improving it when I can carve out a few minutes here and there or when I need a break from the reno dust. We love having a smaller, decorating only, project in our back pockets. In the past couple weeks, I found a beautiful king-sized ivory blanket with dark navy ticking stripes on clearance at Macy’s and I snatched it up faster than I could say Calvin Klein. It adds an extra layer of subtle pattern to the room, ties in to the ivory curtains (team ivory, it is!) and we’ve actually been using it instead of our duvet the last few weeks since it is lighter weight. Deciding on the pieces for our room took some time and planning so I thought I’d share a few tips on how I personally go through the process of putting together any sort of art grouping whether it be a gallery wall or art ledge. 1. 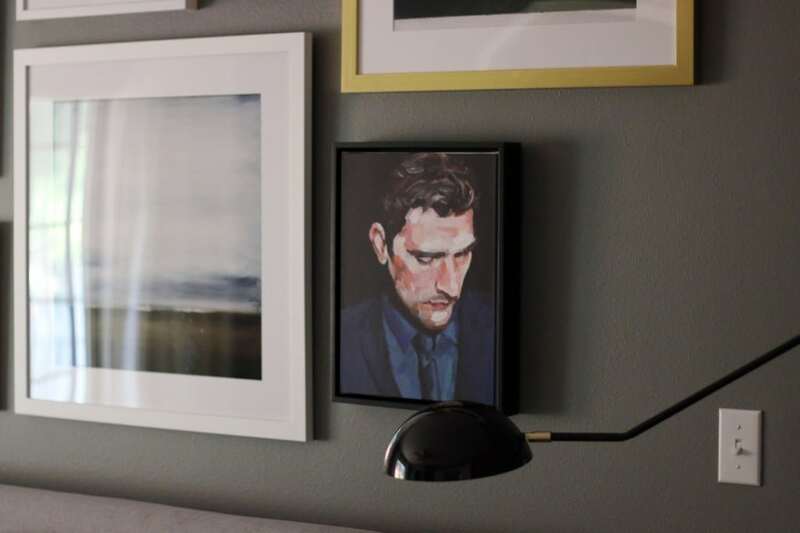 If it doesn’t mean something or make you happy–it doesn’t belong on your walls. While putting together the grouping for our room took more thought than a simple “I like that!”, that is definitely the most important thing and first step. You have to like the art in your home. You just gotta. Art is 100% subjective, although don’t even try to tell my professors in college that. In fact, almost every time someone comes into our house, I get a comment about the Kai Samuel Davis piece leaning on our art ledge in the living room. Sometimes it’s good. Sometimes it’s…interesting. (haha!) but art is wonderful because it invokes opinion and thoughts and emotion. If it makes you happy, that’s all that matters. 2. Decide on a Color Story. 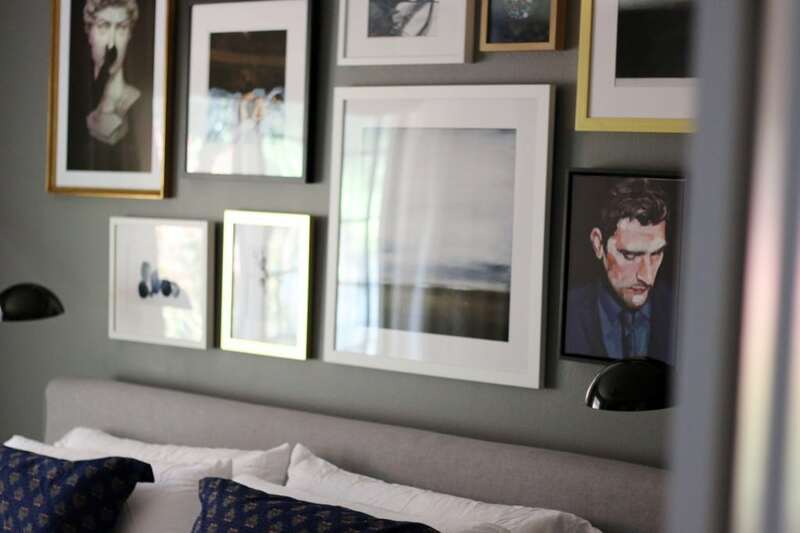 Our whole house has a color story of warm neutrals, blacks and a thread of navy and green so it felt natural to choose that color story for this gallery wall. 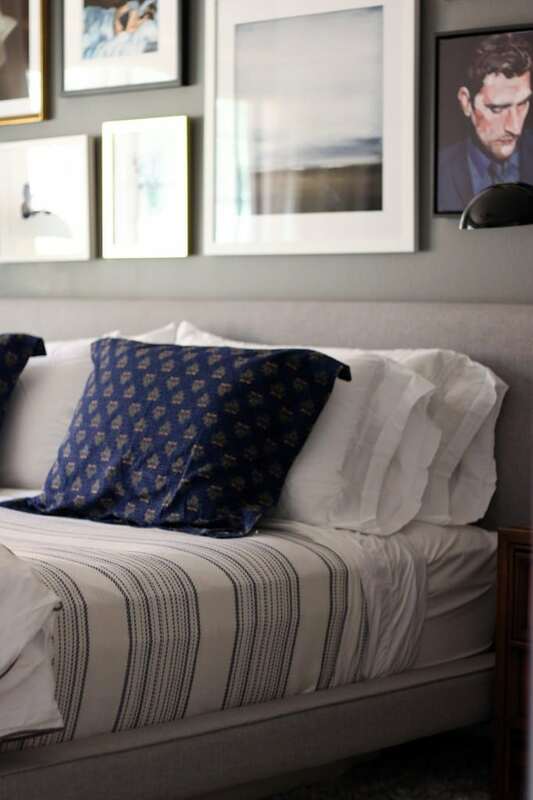 That doesn’t mean that every piece of art had navy in it, but balancing the color across the whole wall (the navy kind of zig-zags here) keeps everything feeling cohesive, while some completely neutral pieces flank the collection. 3. Varied Subjects and Mediums keep it interesting. I think a mix of portraits, landscapes, abstracts, etc., are good, but throwing in photographs and ink drawings and paintings and, boom, you got yourself a killer gallery wall that feels collected and varied and interesting for a long time. 4. Pay attention to size and orientation. After you spent all this time curating the pieces you love, the last thing you want is for them all to be the same size, or all of portrait orientation. Make sure you have a good variation of sizes (Artfully Walls usually has several sizes available for prints) and some horizontal and vertical pieces (as well as squares!) to take your gallery to the next level. The art really turned this room into something that feels like us, which is why I have loved art for as long as I could remember. This room went from being a collection of furniture, to acquiring that lived-in feeling. 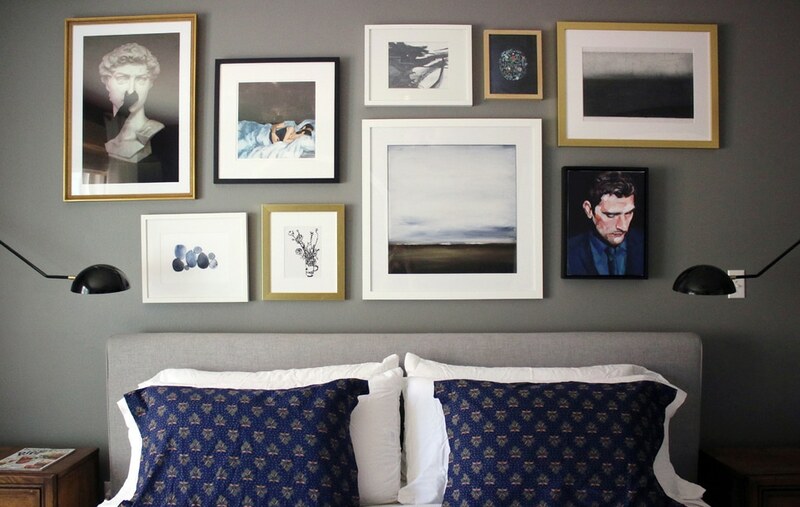 In my next post, I’d love to share some tips on how to arrange and hang a gallery wall. So easy! Stay tuned! 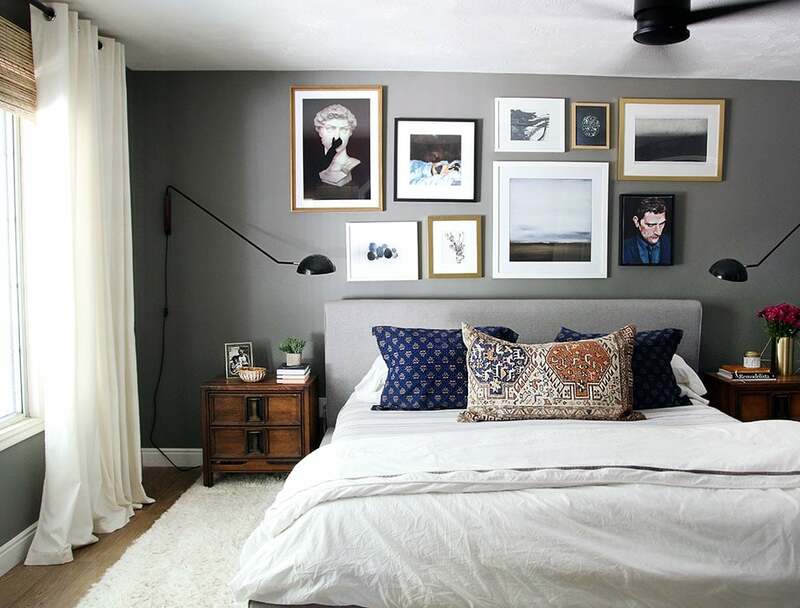 Update: See my easy tips for hanging art right here. Special thanks to Artfully Walls for allowing me to browse their endless collections, curate a gallery wall and for providing me with the art of my choosing to hang in our room. « The Kitchen’s New Layout, with Walls and Everything. Tastes Orangey in the Bedroom. How to Patch Drywall like a girl, Our Freshly Painted Room + $100 to Ace! Hi, what is the paint color ? I love your bed frame! where can I get them?? Thanks Sylvie! It’s from right here. If you have already said, I apologize but could not find it anywhere. Where did you get your bedding? Especially the navy striped blanket? That’s from Macy’s. There’s a link in the first paragraph. I really love this how you combine it together, Julia. Gorg-eous!!! I love how this room is coming together! You guys are just killing it all around. Holy progress batman! Your house is so stunning. I just wish it could go forever and ever!! The whole room looks incredible now! I was not a fan of the ivory curtains when you first showed them but now with the blanket and the art… I’m in love with it all. 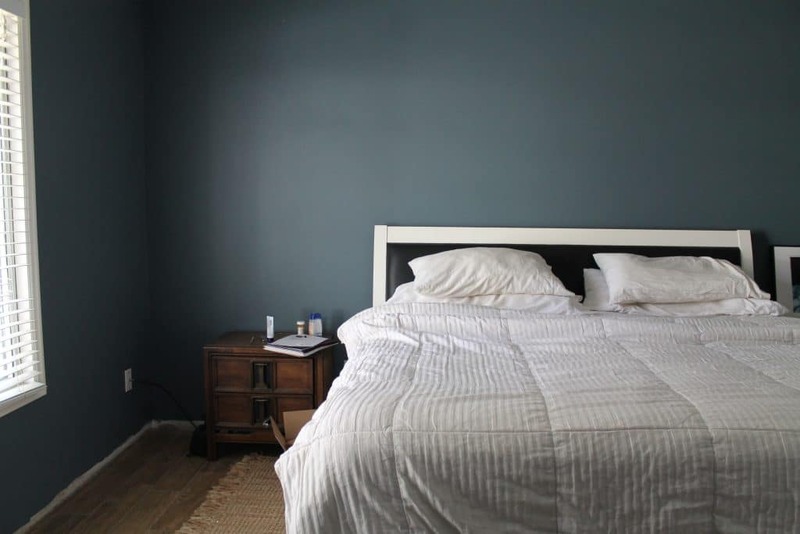 I think that paint color is so perfect for a master bedroom. I’ve been wanting to do a similar color in our room. A few people have suggested just doing an accent wall but i’m not so sure. Do the whole room! You won’t regret it. It feels intimate, warm and cozy. 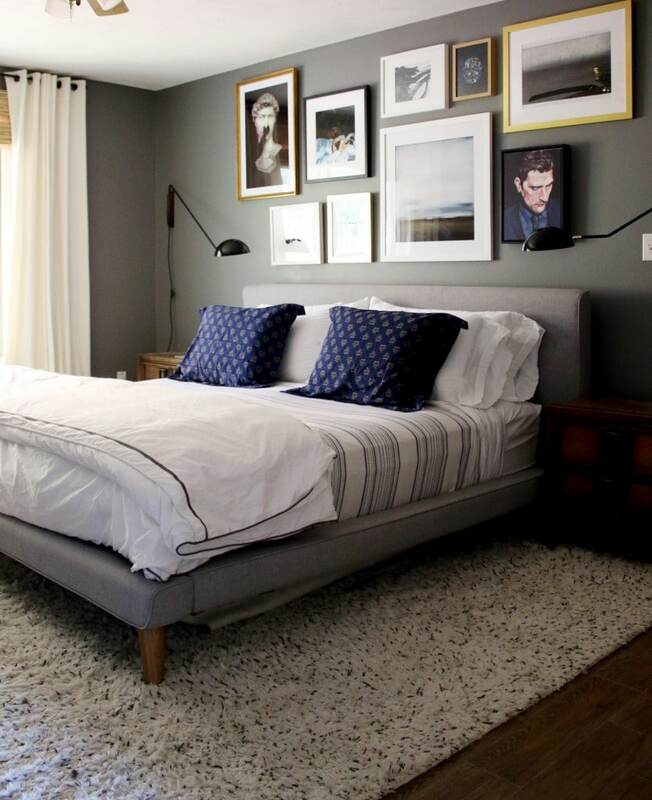 How do you feel about the quality of the frames from Artfully Walls? Are they worth the price? Great site, thanks for the tip! The frames are from Framebridge. We have used them in the past and trust their quality and love their service. I’ll talk more about it in my next post about hanging the pieces. 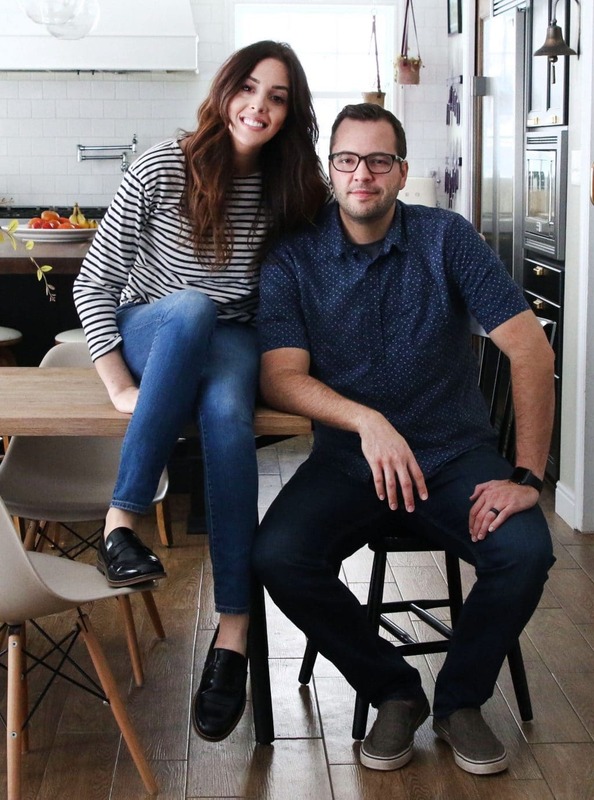 I love your style and ability to create amazing spaces for your family- you have a gift! I was curious if you have any tips for mixing family pictures with artwork. Great question! Like I mentioned in the post, I love mixing in photography with paintings–and believe it only ADDS to a gallery. While I chose to use artistic photography in this gallery (Knuba, 2010), integrating any photography, including family photos done well, would work too! When I was in college and took a few humanities classes, I was always admiring artwork and trying to find ways to utilize them in my living space. I am soooo rusty now. We have a few pieces up but it seems like I am happier framing family pictures for now. I need more wall space! Sorry if you have mentioned this elsewhere, but where is your rug from? Thank you! Hi! I love the arrangement! Could you please share the dimensions of each pieces of art? I’m trying to get an idea of the size they are, and the number I can hang, for the space I’m wanting to this. The print sizes you ordered and the frame size its in.